I have just survived the renovation of an upstairs bathroom. 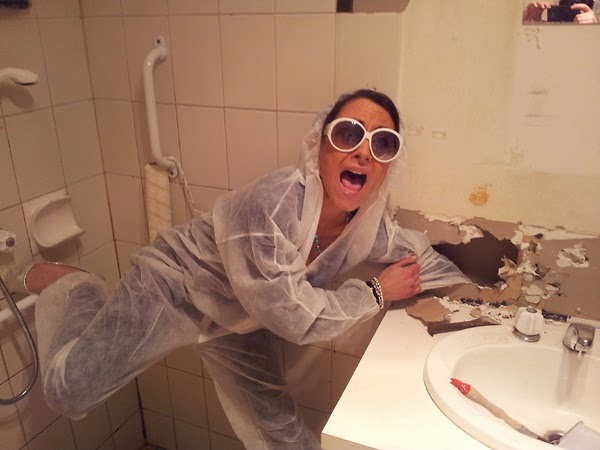 You who have gone through that sort of thing will understand why I use the word “survive.” Any renovation is disruptive, but one involving a bathroom can be particularly awkward. Among other inconveniences was the fact that I had to vacate my bedroom for eight weeks, taking with me to the guest room everything I might need during that time so that my regular room could be sealed off against the bathroom project dust. Before I go further, I should say that I am grateful for any bathroom at all, and I feel enormous gratitude for the resources that made this renovation possible—including a wonderful contractor with a cadre of skilled carpenters, plumbers, electricians, and tile men. I am also grateful for having a spare room into which I could move. And now that the project is finished, I am delighted with the results, which include better light and more efficient storage space. Still, the dust, the noise, the workmen tromping in and out, and the lack of access to many of my belongings—those things were disruptive. I sometimes wondered if the end result would be worth the expense and the bother. But here’s the happy surprise of it: Putting a sustained and focused effort into improving the smallest room in the house has effected changes for the better in almost every other room in the house. A small free-standing cabinet displaced by the renovation ended up in the kitchen, providing much needed storage space there and inspiring a general re-organization of all the kitchen shelves. The loss of bathroom wall space to new built-in cabinetry meant that several pieces of framed needlework required relocation—and that precipitated the reorganization of things hanging in other rooms in the house. Ultimately, I so much enjoyed the simplicity of life in the guest room—with only a couple of pairs of jeans, several turtlenecks and sweaters, and a few other necessities—that before I moved back into my bedroom, I combed its closets and drawers for things to throw out or give away. I wonder if the current season of Lent can operate in my inner spiritual rooms in a similar way. Has something in me has grown too small, too ineffectual, too cluttered, or too complacent? Do I feel called to toss something out or to give something away? Is there a new habit I long to foster? In any case, a decision to observe Lent means that I commit to a Lenten discipline—a kind of sustained and focused inner “renovation.” I may find the process costly, disruptive, inconvenient, awkward. I may become discouraged by how messy things become before they “improve.” But if I see the project through, I will also find that renovating some small room in my inner house effects healthy changes in other rooms as well. I may live into the happy surprise of Easter—than out of the trials of “renovation” can come the gifts and the grace of resurrection.